Earlier this summer, the Philadelphia-based publisher The Head & The Hand Press released its latest publication, the Rust Belt Rising Almanac, is a compilation of literary and artistic depictions of life in America’s Rust Belt cities. According to company founder Nic Esposito, the book “looks at the beauty, art and value of revitalizing America’s urban core, through essays, stories and witticisms," says Esposito. "This book was made to do two things: The first is to show the world that Rust Belt cities are not just depressing, decrepit shells of what they once were, but that they are centers of innovation and opportunity that can provide some solutions for urban development, and also some great art and creativity. The second part is to remind the people of the Rust Belt that this is true." In addition to his work as a publisher, Esposito has written extensively on urban development and grassroots sustainability efforts. In 2011, he published his first novel, Seeds of Discent, which centers on the experiences of urban farmers in Philadelphia. 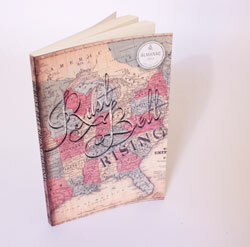 For more information on the Rust Belt Rising Almanac and other work at The Head & The Hand Press, visit www.theheadandthehand.com.